The 50th anniversary of one of Scotland’s worst mining disasters is to be commemorated this weekend. Communities will gather on Friday and Saturday to remember the nine men who lost their lives in a horrific underground fire at the Michael Colliery on September 9, 1967. Three of them remain entombed below ground after becoming trapped. Tributes will also be paid to the heroic rescuers who voluntarily went into “the gates of hell” at the East Wemyss pit to save dozens of other workers. The blaze, which closed the mine for good and led to more than 2,000 redundancies, is still vividly remembered in the Wemyss villages and beyond and some of those involved in the disaster will be present on Saturday. 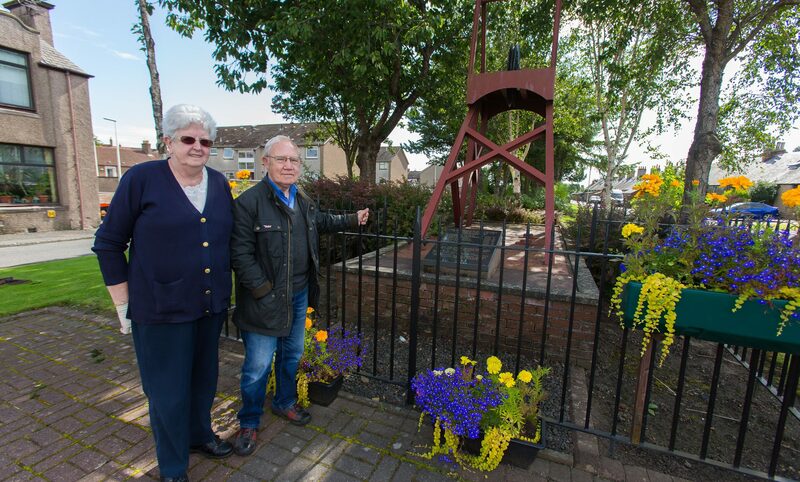 Members of Fife Mining Preservation Society have worked tirelessly for several months to ensure there is a fitting memorial. Duncan Gilfillan said: “One man got back to the pit bath then realised his mate wasn’t there. “He walked back 500 yards without apparatus and brought him back on his back. The anniversary will be marked with two key events. The first on Friday will involve 50 pupils from Levenmouth Academy, as well as some children from East Wemyss and Coaltown of Wemyss primary schools. They will walk to the memorial on East Wemyss High Road, close to where Michael Colliery once stood. Following a service led by Rev Wilma Cairns, nine coloured canaries made by the academy’s art department to represent the men who died will be hung on nearby trees. Canaries were once regularly used in mines as an early warning system of toxic gases. A larger turnout is expected on Saturday when a minute’s silence at 11am will be followed by a service of dedication and speeches by Fife Provost Jim Leishman and Lord Lieutenant Robert Balfour. Nicky Wilson, president of the National Union of Mineworkers, will also speak. Wreaths will be laid before a procession to the site of the Michael Pit head. Elizabeth McGuire from the Mining Preservation Society said anyone who wished to take part on Saturday would be welcome. Those attending should park at East Wemyss Primary School and a minibus will ensure they are at the memorial for 10.45am. An official report into the disaster praised the dozens of miners who walked into the blazing pit to save their colleagues. Without their bravery, it said, the death toll would have been far higher. At the time of the fire, 311 men were working the night shift underground and the fact there were only nine deaths was hailed as remarkable and testament to the actions of the mines rescue teams and ordinary miners. The men who died ranged in age from 36 to 64. Philip Thomson, a married father-of-one who worked at the Michael all his life. Andrew Taylor, a married father-of-three, who had worked there for six months. James Tait, a married father-of-one, who was standing in for someone else at the time. Harry Morrison, married with three sons and a daughter, who had swapped shifts so he could attend church duties in the morning. Andrew Thomson, married with three daughters, who had worked there less than a year. Johnson Smith, who left behind a wife and two grown-up daughters. Alex Henderson, a power loader. Hugh Gallacher, a married father-of-two. James McKay, who was married with a grown up family. Medals for bravery were awarded to three men, including Andrew Taylor whose body was never recovered.